As part of the BBC's Who Runs Your World? series, Mark Almond, Lecturer in Modern History at Oriel College, Oxford University, assesses the myth and reality of "People Power". We live in an age of revolution. To paraphrase Karl Marx, a spectre is haunting the world: People Power. The image of huge crowds, peacefully protesting against corrupt and undemocratic regimes, has become an icon of the modern age. 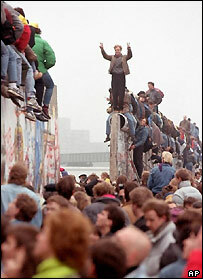 Starting in the Philippines in 1986 where the term "People Power" was coined, and taking wing in 1989 when a sea of people seemed to swamp the old guard communists in East Berlin or Prague, the myth of popular revolution took flight. A decade after the fall of Soviet-style Communism, another wave of People Power swept away many of the post-Communists who had established themselves in office after the red flag came down. From Serbia in 2000 to Ukraine last Christmas, the same scenario was played out: disputed elections were followed by crowds on the streets and the fall of the bad guy. People Power seems to be getting a habit. But is it really so simple? Mass psychologists know how intoxicating participation in a crowd can be. Observers as well as participants get caught up in the party mood. But intoxication is never a good guide to understanding. The carnival atmosphere of People Power revolutions in recent years - the round the clock rock concerts in Kiev last winter, for instance - obscure the politicking going on away from the party. Whether in Prague in 1989 or Serbia in 2000, deals cut in smoke-filled rooms had as much to with the bloodless success of People Power as the crowds on in the streets. In most societies at most times in history, people have had good grounds for discontent. Mass revolutions have certainly been commonplace since Parisians stormed the Bastille in 1789. In reality, when the crowd stormed the prison, lynched the governor and his guards, they found only seven prisoners to release - none of them political. Anti-climatic though the liberation of the Bastille was, it became an iconic moment in history. For 200 years, the image of the masses storming government buildings and toppling the old regime haunted public imagination. Films like Eisenstein's October, 1917, were taken for docu-dramas even though more extras were killed in the frenzied re-make of the storming of the Winter Palace than in the actual tame handover of power to Lenin's Communists. The filmmaker's image of a revolutionary tidal wave stuck in minds around the world. Peaceful images of People Power revolutions since 1989 have usurped the place of cataclysmic crowds from France or Russia in popular imagination. But does People Power really deliver its promise of liberation from corrupt politicians? The problem is that The People cannot rule. Only some people can do that. People Power can eject one set of rulers and propel other people into high office. But People Power alone cannot guarantee constitutional or honest government. Look at the record of recurrent popular protest and corruption allegations in the Philippines since 1986. 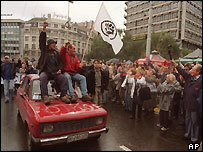 Think about how the Serbian leader, Zoran Djindjic, was gunned down three years later by the very para-military policeman who had pulled the rug from under Slobodan Milosevic by joining the people. 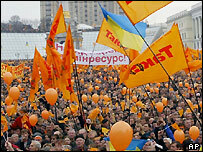 Or consider the mud-fight going on in Ukraine among last year's heroes of the Orange Revolution. The problem is that corrupt regimes tells us something about the society which they rule. Ferdinand and Imelda Marcos may have plundered the Philippines, but their regime also reflected deep-seated social problems. As Zaire's Mobutu once remarked, "It takes two to be corrupt." Popular indignation zeroes in on a bribe-taking head of state but without bribe-giving businessmen, domestic and foreign, massive corruption cannot happen. At the bottom of the social pile, ordinary people resent corrupt cops but how many ordinary people haven't paid a bribe to a traffic cop to get off a charge - if they could afford it? Filipinos chased the Marcoses out of their country bloodlessly, but they couldn't get the Marcos inside themselves out so easily. Nor have Ukrainians found that their new rulers were more honest than the old ones. Once the bad guy at the top falls from power, it is naïve to think that the rest of the bureaucratic pyramid will mend its ways overnight. People, all of The People, were socialised under the old regime and cannot escape from the reality that its grimy habits cling to them after its leaders and symbols have been toppled. The carnival of a People Power revolution, like any great party, leaves its participants with a hangover. Today's cult of People Power as the solution to corrupt and incompetent government risks promoting an endless cycle of upheaval. The only solution to the cold dawn of cynical reality which follows the long night of revolutionary ecstasy is another fix of revolution. A kind of parody of Trotsky's "permanent revolution" is preached as the solution to society's ills. Yet successful societies are boring ones. The dull work of constitutional government with its checks and balances does more for the people than a brief moment of glory on the streets. Revolutions may sometimes be necessary but their outcomes are always messy. The danger today is that when ordinary people see the intrigue and backroom deals which accompany People Power behind the scenes, they plunge from hope to despair. Far from energising true democracy, People Power's "day after" of cynical politics as usual causes the people who went on the streets in millions to sink into apathy for years to come.